This section gets right into the meat of a post-book world, ebooks for free and about the ‘social.’ I am quite ambiguous about this change I’m speculating, but it is interesting right?.. Of course, wearing my bias outright, my research in the field is exactly about how authors can best get along (and get paid), so I must point out Cat Valente’s post here. Graham woke painfully, and felt the beginning of a diabetes-like ache in his chest. It wasn’t a hangover, but the withdrawal of the usual alcohol lubrication in his veins. He’d recently figured that the bulk of his calorie intake had come from the drink—and right then he was starved. He didn’t want to think of it. Instead, he looked around the room they’d stayed the night in. He hadn’t been able to see it too clearly the night before, the whole neighbourhood having been in a planned brownout. Emlen had had his own key through into the room, from an alleyway out the back. Once they were inside the Victorian terrace, he’d left Graham there, slipping free to talk with the owner—or that’s what Graham had assumed. Graham had been exhausted, and hadn’t minded being left alone at all. While he knew that it couldn’t have been a good place, he hadn’t been able to maintain any more stress than a brief, healthy anxiety, and so he’d slept. As morning had come, the light well installed down the original chimney showed him their true predicament. While the chimney itself was glazed green tile and wrought iron—beautiful—the rest of the small room was crude particle board stapled into place. Emlen had returned in the dark, and was wrapped in his ur-leathers—he appeared to be sleeping however he could manage. The room was crowded with plastic mixing tubs, guillotines, clamps and vices all smelling of glue and other chems—it was some kind of lab. A closer inspection of the spray-painted walls showed finger-width gaps, where curls and twists of off-white fibre were packed firmly inside. “Don’t touch that.” Emlen spoke behind him. Graham looked around from poking, to see he was awake. “It is.” Emlen stood, tall and grey as driftwood. “Wonderful insulation—against many intrusions—Robert shreds them, any of the bounds that he can’t resell himself, ‘waste not, want not.’” He laughed. “Even unrepentant bibliophiles have to be realistic at times.” Emlen grimaced as he stretched. “Where the hell are we?” Asked Graham. Still, better here than dead. Emlen crossed to the door and knocked on it in a complicated staccato. Then waited. But not too long, so that when the door opened outward, it showed the owner, Robert, must have been waiting for them outside. He actually did look like a drug dealer—one not so happy to have them. He nodded, and Graham followed after Emlen through the door. Behind them the room closed blind, the doorway that led through to it camouflaged in feathers of the scabbed, antique wallpaper. They seemed to be in the man’s kitchen, the smell of the room they’d left behind resolving into that of pickled cabbage. “I’m still closed Emlen, so you better come down to the shop now, and explain yourself before I kick you out.” He hadn’t looked at Graham, and Graham had the feeling that he never would. Maybe it was safer that way. They followed the man down a narrow terrace stairway, and at the bottom of it Graham had to gasp at what he saw. They had stepped into a den of iniquity. Almost a library, but not like their collection had been. Like nothing he’d ever seen in real life; open-faced shelving of raw-grained wood and particle board, slotted like a circuit stack with bounds, their spines sticking outward. It was the worst possible way to store them. Christ… All that pressure on the binding—perhaps he secures them through the page-ends, Graham thought, not to have the volumes lifted by unscrupulous hands, slicing the chained spine away from the print. Sure, that must be it. Emlen laughed. “You seem shocked by what you see Graham?” Yes, he was. Obviously, this was one of those ‘secondhand’ stores; though not actually illegal, they were the very worst of the gray bounds market. They’d never raided that kind of place for the collection; only from fully certified, Cache-standard collections. Thankfully. He could safely swear that he’d never been inside that kind of place before. It actually made him gag, the smell of cheap acid burning into cellulose; the kind of firetrap lounge you heard the police would have raided. He stopped at the entry. Better than being dead? … That smell?… he choked. It was a potpourri. There was a reason the police often targeted and burnt those stores down—uncontrolled outbreaks of Inspiration. No, he couldn’t talk about being legit. Just that it was so different from the Collective’s own industrial look, or like the luxury bound showrooms of the publishing Houses; like art galleries, each on message like a laser: sell the bounds showing, or lock-in a digital sale. Robert motioned them over to a couple of packing crates, and just shrugged when Graham shook his head at that suggestion violently. He preferred to stand, touching nothing. He noticed, as Robert hunched against the counter, that there was a cash till upon it; oh yes, and what better signifier would there be that there was something wrong with the place? Cash, the plague rats of finance. “I can’t imagine you were foolish enough to be involved in the damage to Gordon’s Library last night,” Robert said to Emlen, he looked quickly Graham’s way instead, “but you’ve got to understand the position you’ve placed me in. There are groups noticing what you’re up to.” Robert moved around his counter, placing it between him and the other two men. “I’ve been good to you in the past, Emlen, but you can’t bring the heat on me like this. You understand? They’ll come and raid us over your mad stunts.” Graham felt his face pinch. He didn’t understand, if he was the liability, what was Emlen doing with him? The two of them watched one another, seemingly playing out a psychic battle. Graham really didn’t know who he wanted to win. In the end, it seemed that Robert broke himself, giving it away. “I don’t know Emlen, there are rumours you’re bringing something to the market—“ Emlen stood bolt upright, suddenly threatening. 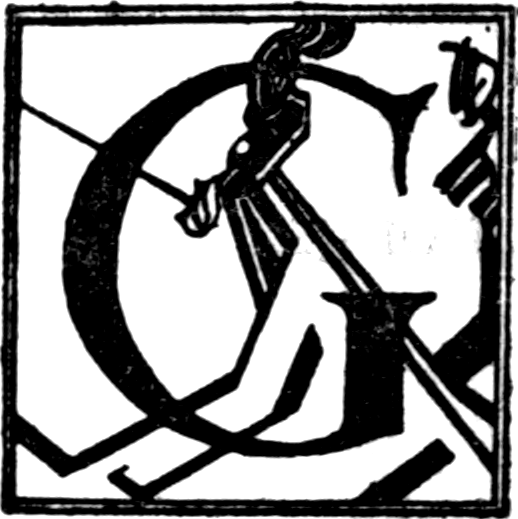 Initial G from page 14 of Hugh Selwyn Mauberley (1920) by Ezra Pound. ← Night of the Living Footnotes? When Footnotes Attack? Footnotes in Space? I love how appalled he is by the bookstore, by the idea of them using cash. It’s great seeing the underlying prejudices that exist in a changed society. Speaks a lot more to the future setting than the tech or the images of more ‘modern’ libraries that we’ve already seen. Yeah, and now I wish there was more of that that I have… but there isn’t really. It’s all ‘nano’-this, ‘quantum’-that. … there is the bound-fetishists coming up though?..